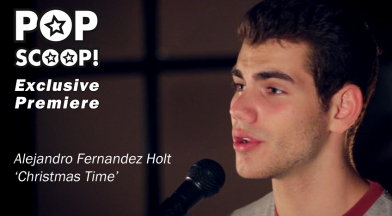 We’re pleased to bring you the exclusive premiere of ‘Christmas Time’ by recording artist Alejandro Fernandez Holt, available as a digital release from Nov 24th. The single is currently available for pre – order at iTunes. Check out the preview video below! The new released on Ditto Music is a pop Christmas song performed by UK recording artist Alejandro Fernandez Holt. In it Holt unfolds a story of rekindling a romance just in time for Christmas. ‘Christmas Time’ has been established as a warm and festive holiday release with vocal styling’s similar to that of Cody Simpson and Justin Bieber. ‘Christmas Time’ is the artist’s debut release and he has long been recognised as the most memorable contestant on 2013’s X Factor. Alejandro’s version of the popular Enrique Iglesias song ‘Hero’ has received over six million views on Youtube and became a fan favourite on the ITV’s flagship show. Alejandro Fernandez Holt, who has lent his name as a model for American lifestyle brand Hollister, mentions that philanthropy is incorporated within his career and he is an avid supporter of the Great Ormond Street Hospital. ‘Christmas Time’ will be available to purchase on all major digital retailers from Nov 24th, with a video premiering on Alejandro’s official Youtube account on November 12th.